15/0 Delica Hex Beads - Bello Modo - Your Online Source for Beads, Seed Beads, Swarovski Crystal, Findings, Tools and So Much More! MIYUKI'S smalest delica bead size 15/0 which is smaller than DB 11/0 named "Delica precision cut 15/0 (DBS)". We package them in clear 2x2" bags holding approximately 5 grams. 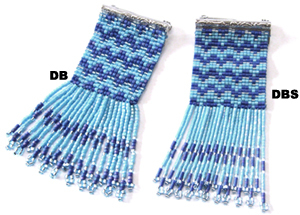 Fringes which were made using the new DBS swing smoothly just like a silk thread.